A Leaf on the Wind is a sky blue jelly base with tiny silver and medium light green glitters. These photos are 3 coats with top coat. Bikini Bottom is described as a pale beige crelly with tiny brown, blue, red, and yellow glitters. All nails are 3 coats with top coat. A polish I do recognize the inspiration for! Good ole' Spongebob Squarepants! I know this seems silly, but I really love how subtle this polish is given it's inspiration. :) It's not so in your face with tons of yellow and blue glitters, though if you know the name you instantly get where the colors come from. :) Formula was again great! Golden Snitch has a pale cream crelly base with all different sizes of gold and holographic gold hex. Shown is 3 coats with top coat. I don't know much about Harry Potter and you don't need to either, to see how beautiful and delicate this polish is! ;) Seriously I am totally in love with this color! It was the first one I put on when I received my package from Lucky 13 Lacquers and didn't take it off all weekend. :) Formula was again awesome and I didn't need to fish for any of the larger golden hexes. Go buy it wether you are a Harry Potter fan or not! You Can't Take the Sky from Me contains various sizes of silver glitters in a shimmery charcoal jelly base. Here is 3 coats with top coat. 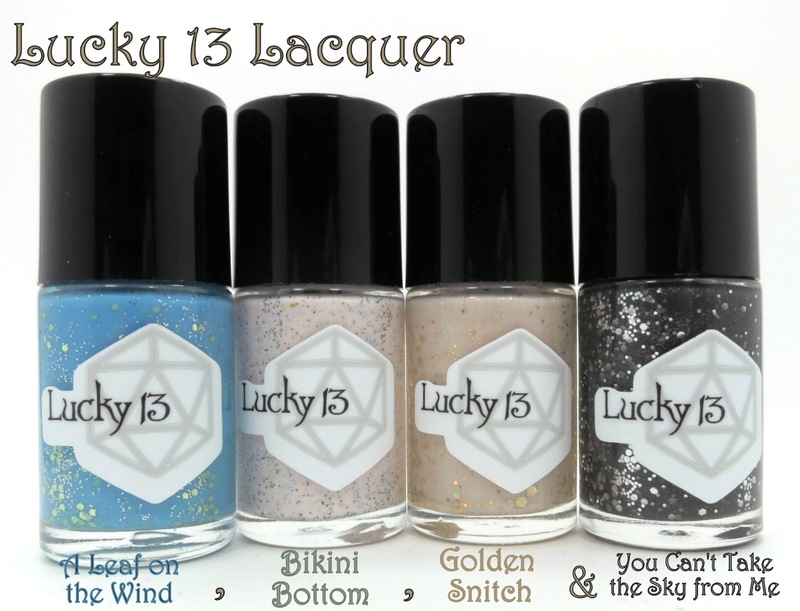 Find Lucky 13 Lacquers through Lucky13Lacquer.com. Follow Lucky 13 Lacquer on Facebook, there is currently a 10% off coupon code posted on their page so make sure to check it out!